Kozmophone holographic Bluetooth turntable raises £90k on Kickstarter | What Hi-Fi? The Kozmophone comes with a detachable Bluetooth speaker, mood lighting controlled via app and a cartridge from Audio Technica. But a Bluetooth-streaming, holograph-projecting, wireless-charging phonograph? That's new. 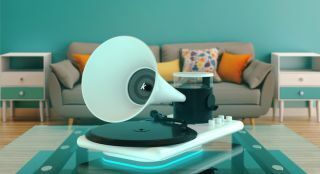 Called the Kozmophone (and currently still in its crowdfunding stage on Kickstarter), it does indeed feature a horn for playing your records - but instead of the usual phonograph horn, it's actually a speaker that can be detatched and used wirelessly. That 30W, 3in speaker can also be paired to your phone via Bluetooth, with a claimed 12 hours of battery life for portable listening. If you want to keep it attached, it has 360-degree rotation to send audio anywhere in your room. The player itself has an RCA line out, for connecting with more powerful speakers, and a headphone socket for private listening. There's even a built-in headphone stand for when you're not uing your cans, which is a nice touch too. The cartridge is provided by Audio Technica (specifically, it's the AT91 moving-magnet cartridge). If that was everything, the Kozmophone would be an impressive turntable - but there are more features thrown in. There's wireless charging for compatible smartphones (like the iPhone X) if you put them on the pad at the top of the player. Underneath that is a little holographic projector (that seems to be similar to the holographic TV device the BBC experimented with in 2016). And there's mood lighting at the bottom (also controlled by the Kosmo app) that can be either ambient or used as an audio visualiser. You could even make it match the colour of the Kozmophone, which comes in red, black, blue, yellow, green or white (or there's a $5000 18K gold special edition version, for some reason). Speaking of price, a £190 backing will get you a Kozmophone (although it's worth remembering not all crowdfunds come true, so don't pay anything you can't afford to lose). While we can't speak about sound quality it's an impressive device, one we hope to get our hands on.